NIT Puducherry Notification Recruitment 2017 : Here are details of NIT Puducherry Junior,Lab Work Assistant,Stenographer. NIT Puducherry is being used by recruiting Junior,Lab Work Assistant,Stenographer. The Junior,Lab Work Assistant,Stenographer’s job to apply is 27-28 June 2017 deadline. If you want to see details of the NIT Puducherry Junior,Lab Work Assistant,Stenographer read this post. Details are given below.To apply to this job must have 12th UG. for more details can click on official website and alljobalert.in. The National Institute of Technology, Puducherry (NITPY) is an autonomous public engineering Institute located in union territory of Puducherry. It is one among the 31 National institutes of Technology of India and is declared as an Institute of National Importance by Government of India under NIT Act, 2007. The institute was established in 2010, starting its intake in the academic year 2010-11. First Class Bachelor’s Degree in Commerce with Honours in Accountancy/Finance or equivalent in grade from a recognized University or Institute. Master’s Degree in commerce / MBA (Finance) from a recognized University or Institute with excellent academic record. 10 + 2 in any discipline with a minimum typing speed of 35 w.p.m. and proficiency in Computer Word Processing and Spread sheet. First class Diploma in Engineering in relevant field with excellent academic record. Senior secondary (10+2) from a recognized board and ITI Course of one year or higher duration in appropriate trade. Matric with at least 60% marks and ITI Certificate or 2 years duration in appropriate trade. Diploma in Engineering of three years duration from a recognized Polytechnic/Institute. B.Sc. Degree in relevant field from a recognized University/ Institute. First Class (Honours) Bachelor’s Degree or equivalent grade from a recognized University or Institute in any discipline. Master’s Degree from a recognized University or Institute with excellent academic record. 12th Standard pass or equivalent from a recognized Board or University. Minimum speed in short hand 80 w.p.m in Stenography. Post Graduate degree in Science or BE/B. Tech. in relevant field from a recognized University or Institute. 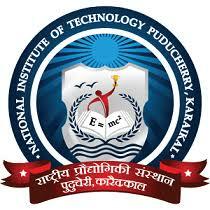 · Visit the recruitment section of NIT Puducherry. · Download the details of NIT Puducherry recruitment.